The “Builders’ Club” of the East Bay hosted the fourth annual Bishop’s Barbeque in support of Cristo Rey De La Salle at Bob and Joan Marx’s Summit Ranch at the base of Mount Diablo. Bishop Michael Barber, S.J. said grace, and President Mike Anderer presented our school’s unique program to the potential donors and friends of the school in attendance — including a couple of St. Elizabeth alumni! 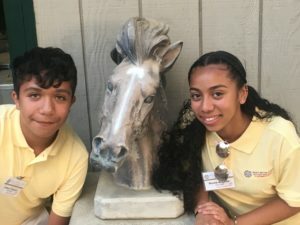 Cristo Rey De La Salle East Bay High School’s Mustang Freshmen Nuvia and Jesus impressed the crowd with their maturity, intelligence, and ambition. Nuvia even met a couple of her new colleagues – rising freshmen at St. Mary’s College in Moraga. (Stetson) hats off to the Builder’s Club for organizing an A-OK shindig!